Are you finding it harder to hear or understand what others are saying? Are you turning up the volume on the television or radio? Are you concerned about the impact of your job on your hearing? Do you have a ringing or other distracting noise in your ears that makes it more difficult to hear, sleep, or concentrate? Come and see us at The Hearing Clinic and take control of tinnitus, hearing loss, wax build up, or poorly fitting or programmed hearing aids. We can also help you to protect your hearing from damage. We perform annual hearing health checks to spot any potential problems and treat them before they develop. Everything we do is tailored to your unique challenges. In addition, we also offer hearing protection devices including swimming plugs, musician plugs, and other protective products to reduce the risk of damage to your hearing. Bridgitte Harley, senior audiologist and founder of The Hearing Clinic, is also a certified provider of The Listening Program, designed to help children with auditory processing disorder (APD). Hearing difficulties can affect people of all ages, from the very young to older adults. We provide you with the comprehensive, flexible care you need to make the most of your hearing. If you have concerns about your or your child's hearing, want to be proactive with protection from potentially harmful environments, or are looking for support in managing hearing problems, book your appointment today. My child was put at ease by the knowledgeable and friendly audiologist who explained every step of the process in an accessible way to us both. The staff are very friendly and have a real depth of knowledge. Excellent service. My initially apprehensive and nervous 5 year old son was made to feel very secure and confident about having his hearing tested. Very good procedure carried out with excellent explanations. Very satisfied. Very relaxed, relevant information given. Lovely audiologist. Very satisfactory. I felt that I was listened to, and my problems were dealt with considerately. A very helpful and professional appointment thoroughly explained. We are very grateful for your expertise and help. The explanation of the options open to me was especially helpful. Pleased with the service provided. My procedure was dealt with efficiently and professionally. Pleased with the service provided. Excellent service. Very pleased with the results. I had a cold that went directly to my right ear completely blocking it, and unfortunately, no amount of drops made any difference and any extensive prodding from my GP, just made it hurt, so I was so happy to be recommended to The Hearing Clinic, & Tricia was amazing as within five minutes ur was sorted. Very impressed, excellent service. Very efficient friendly service. The procedure was carefully explained to me so I knew what to expect. The wac removal was painless and quick and my hearing was much improved afterwards! 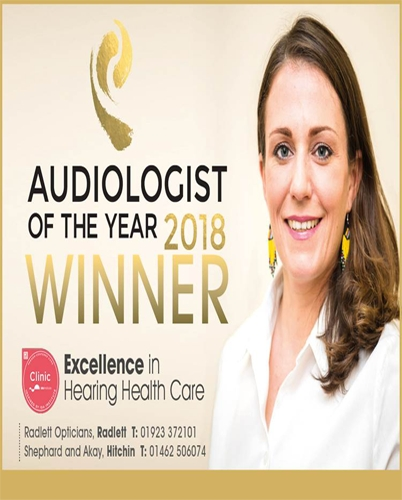 Bridgette Harley is, in my opinion, an outstanding audiologist and I have total confidence in her clinical ability and the quality of her professional advice. I would not hesitate to recommend her if you want the very best. I was treated with courtesy and consideration and everything was well explained to me. Trisha was very patient and understanding throughout the consultation. An excellent service. Always very friendly, polite and professional. I am confident that I am receiving the best care possible. Ms Harley and her team have always been most patient, considerate professional and her wealth of knowledge and good advice has given me the confidence to cope with my hearing loss. Great experience. I was almost deaf in one ear with wax which was causing me a significant amount of distress. The treatment was painless and completed in a few minutes. Bridgitte explained the procedure to me very clearly and was very professional and caring. Very courteous and thorough appointment. Also very informative. Bridgitte is very professional and highly experienced. Bridgitte Harley is very professional and caring. My yearly appointments with her are a pleasure to attend. She makes sure that all options are explained !!! Bridgette ensures that her clients are completely satisfied with their treatment. She makes sure that all options are explained in an understandable way. Very thorough and professional attention, giving me 100% confidence.